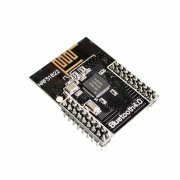 This BLE4.0 Bluetooth module is a wireless module based on nRF51822. nRF51822 is a multi-protocol, single-chip solution for ULP wireless applications. It incorporates Nordic’s state-of-the-art wireless transmitter, supports BLE4.0 and 2.4GHz RF Soc designed for ULP. This module is tiny and stable, can be used into products directly. It can be use on wearable devices, Bluetooth intelligent application, mobile phone accessories, smart home appliances, RFID labels, data acquisition and etc.